Grandad Science: Do You, Your Kids, or Your Grand Kids Have the Right Stuff? Do You, Your Kids, or Your Grand Kids Have the Right Stuff? When grandadscience was a kid, the first TV set in our neighborhood attracted every kid living on G Street to the owner’s house. When the Atari 800 home computer hit the market in the early 1980s, grandadscience was the first kid on the block to own one. That computer pulled neighborhood kids, like a magnet, into our house. We played hundreds of Pac Man, Missile Command, and Star Raiders games without having to put a single quarter into a slot. Actually, many of the games we played were, in fact, very educational to play. My two favorites were SCRAM (you ran a nuclear power plant) and, the topic of this post, Lunar Lander. Joshua, our oldest grandson, was with us for Easter and I was pleased to learn that he was excited to play the Chabot Science Center’s online version of Lunar Lander. As the title implies, the challenge is to land the Lunar Excursion Module (LEM) on the surface of the moon. Fuel is limited and you must set the LEM down softly or it breaks.View this video for an actual in-game demonstration as to how to play the game. The power of the game (and every other ‘science-based’ simulation) is that it reverses the traditional way science is learned. In school, students first learn the theory and then, if the student is lucky, they apply it. In playing the Lunar Lander game, you choose to learn, through trial and error, how to control the motion of the LEM so as to consistently achieve safe landings. The original Apollo astronauts spent many hours practicing in the NASA LEM simulator. Doesn’t it make sense that understanding the application first, makes learning the theory easier? 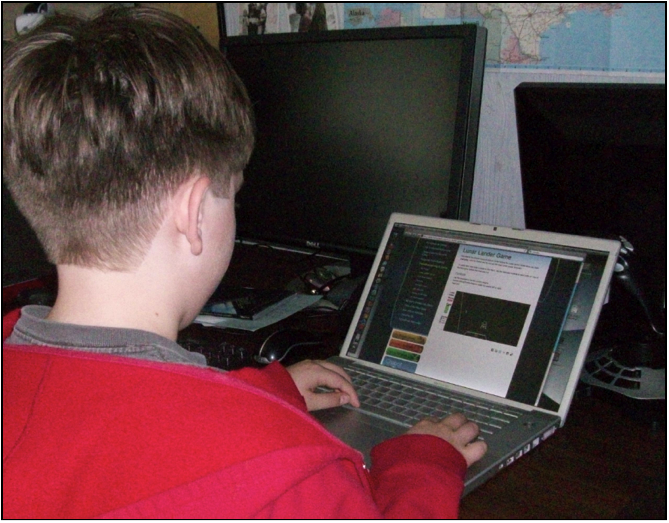 A characteristic of any "computer simulation" is that evaluation (educators call it assessment) is built into the game. In Lunar Lander, evaluation is automatic; the player either successfully sets the LEM on the lunar surface, or crashes. Success is measured by how many soft landings the player can string together without a crash. Each successful landing is scored according to its difficulty. The landings get progressively harder and the player won't get past the first three or four without having figured out how "force" affects the motion of the LEM. Once this happens, the player becomes eager to maximize the score. To play the game, click on this link. There’s a very sophisticated version of Lunar Lander available for the PC. It puts the player in the LEM cockpit with its myriad of switches, circuit breakers, dials, and controllers. Watch this short video that duplicates the Eagle (Apollo 11) landing on the moon. There’s a thick manual that goes with this program and if Joshua (or any other of the grand kids) ever get interested in learning to fly a much more realistic LEM, I’ll help get them through the manual and the program.